Jovago.pk hosts its 2nd hotel awards at Luxus Grand Hotel to award the best rated hotels and to support the travel industry of Pakistan by creating awareness about the potential of e-tourism and online hotel booking in Pakistan. Lahore: In order to promote tourism, Jovago.pk, Pakistan’s No 1 Online hotel booking website, organized its second annual hotel awards on 14th December in Lahore. The purpose of this event was to applaud the best hotels in Pakistan as well as to raise awareness regarding the domestic travel and tourism industry among the general public. 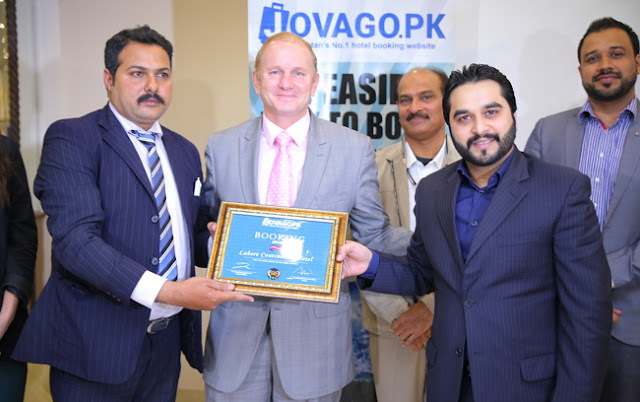 Through this event, Jovago aimed to strengthen the tourism and hotel industry of Pakistan by recognizing and rewarding the best hotels a token of appreciation for their exceptional customer services reflected in their traveler ratings. Commenting about this event, Managing Director of Jovago.pk, Ms. Tina Wang said, “Jovago.pk endlessly aims to create initiatives beneficial for the entire travel industry of Pakistan, that will not only promote domestic tourism but also generate great revenue, therefore boosting the economic sector of Pakistan. By educating travellers how to comfortably book their accommodations at the best rates, we want to make it simple, secure, and convenient for travellers across Pakistan to experience the beauty that our country has to offer.” “It is an honor to work with all of our exceptional hotel partners and furthermore, we congratulate the award winners on their achievement,” she added. The presence of the honourable Guest of Honour Mr. Ahmer Mallick, MD Tourism Development Corporation of Punjab and Chief Guest, Tania Qureshi, Deputy Director Media & Marketing, Walled City of Lahore Authority further added to the prestige of the event and recognized the growing potential of the travel industry in Pakistan.